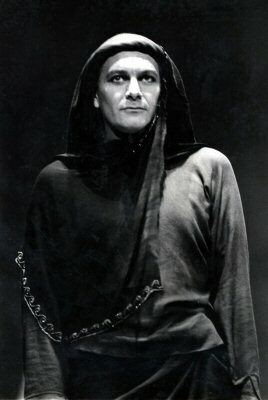 Richard Armstrong’s first professional performances with the Roy Hart Theatre were in Euripides’ The Bacchae, at the World Theatre Festival of Nancy, France in 1969. The revolutionary vocal approach of those performances was the “event of the festival,” according to the press at the time. 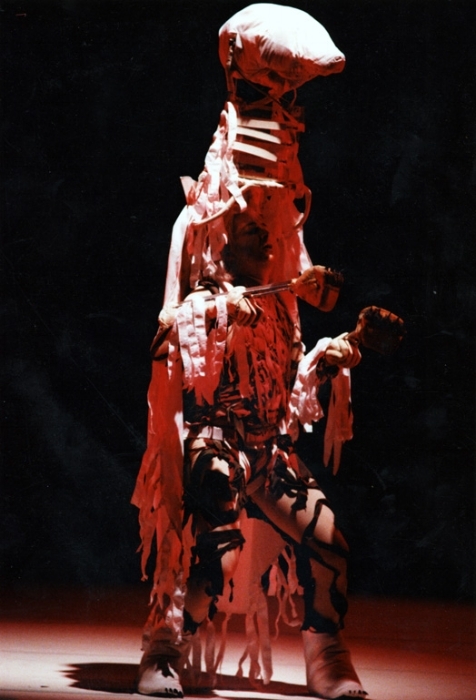 Subsequent tours in Europe took the company to Paris in 1972 for Jean Louis Barrault’s “Théâtre des Nations,” where Mr. Armstrong performed in and co-directed and, a groundbreaking performance without words. From 1974 onward, he directed continuously for the Roy Hart Theatre, contributing notably to their version of Shakespeare’s The Tempest, in which he also played the role of Caliban. From 1985 to 1986, Mr. Armstrong and Paul Zimet, director of the Talking Band of New York, co-produced Furies, based on Robert Lowell’s version of The Oresteia. This production, mounted first in Paris before inaugurating a new performance space in the crypt of St. John the Divine in New York, saw Mr. Armstrong playing the role of Clytemnestra. Tour-de-force performances in France as a soloist in Theodorakis’ Canto General throughout the 1980′s gave Mr. Armstrong the opportunity to create the central role of Jean Genet in an oratorio version of Le Condamné à Mort in Paris, which was recorded and released on disc. Mr. Armstrong’s collaboration with playwright Jean Claude Van Itallie in the 80s, began with his role as vocal consultant for Van Itallie’s version of The Tempest in New York in 1984. He then gave vocal training to the cast of Van Itallie’s play The Traveler at the Mark Taper Forum in Los Angeles in 1987, and acted as vocal/musical consultant for Van Itallie’s production of Genet’s The Balcony, in which he also played “The General,” at New York University in 1988. In 1989, Mr. Armstrong directed Marguerite Duras’ The Malady of Death for the Talking Band at Theatre for the New City in New York, with music by avant-garde composer “Blue” Gene Tyranny and performers Rosemary Quinn and Tina Shepard. 1990 saw the culmination of a long collaboration with British composer John Metcalf on his opera Tornrak, in which Mr. Armstrong created three animal roles – a polar bear, a dancing bear and a wolf – specially written for his voice by the composer. The opera, commissioned by The Welsh National Opera, premiered at the Banff Centre for the Arts before touring Great Britain. Tornrak subsequently won the Best New Opera Award from Opera America. Mr. Armstrong also collaborated as soloist with music director Jean-Pierre Drouet and composer Mauricio Kagel for the North American premiere of Kagel’s musical epic La Trahison Orale in 1990. In 1991 Mr. Armstrong provided vocal direction for new productions of Sir Harrison Birtwistle’s Punch and Judy and Sir Peter Maxwell Davies’ Miss Donnithome’s Maggot and Eight Songs for a Mad King (performed at Stratford Festival, Canada) . The following year he created and directed Subtle Surprises Ahead, a new music theatre piece with works by Georges Aperghis, Frederick Rzewski, and John Metcalf, while providing vocal coaching for Andrew Toovey’s new opera Ubu (performed in Canada and Great Britain). The 1990′s saw a revival of Theodorakis’ Canto General in France, with Mr. Armstrong as soloist, playing to ever-increasing audiences. The work was chosen to inaugurate the dismantling of Europe’s borders, along with a chorus of European choirs) at the Opera Berlioz, Montpeliier on 30 December 1992, and issued on CD. In the 1990′s Mr. Armstrong’s unique approach to the voice made him an increasingly sought after director and consultant for productions in Canada and the United States. Among these many projects were Dreamsongs, directed for New York storyteller and writer Diana Wolkstein (performed in New York San Francisco and Santa Barbara), several works for Winnipeg composer Diana McIntosh, vocal coaching for productions by Birtwistle, Zimmerman, Nyman, and for Fides Krucker's Toronto-based URGE ensemble. Mr. Armstrong's reputation for radical vocal innovation led to an invitation from composer Owen Underhill to collaborate, as director, in the creation of his opera The Star Catalogues for Vancouver New Music. A two-year process ensued, leading to a sold-out production in 1994 and "the most impressive new work from Vancouver artists in a decade" (The Vancouver Sun). Mr. Armstrong was invited back in 1996 to perform Muscle of the Soul, a solo piece conceived with director Fides Krucker. 1995 saw Mr. Armstrong vocal directing the Canadian premiere of Hans Werner Henze's Ei Cimarrón; of baritone Gregory Rahming the Toronto Star wrote "...it was his voice which provided the production with its artistic centre." After performances across the USA and in Europe, in October 2000 Mr. Armstrong was invited to redirect the soloist for a triumphantly received concert in the presence of the composer at Carnegie Hall. For the 1995 Banff Festival of the Arts, Mr. Armstrong reinvented the cabaret genre by directing What Keeps Mankind Alive? and Gibraltar May Tumble to rave reviews and sold-out houses. During the 1996 festival, he directed the world premiere of De la nature de la gravité and the North American premiere of De la nature de l’eau, both by Georges Aperghis, one of Europe’s leading exponents of music-theatre, reuniting with Jean-Pierre Drouet as music director. In 1997 he directed the North American premiere of Women. War. Comedy by Thomas Brasch for New York's The Other Theatre. In 1998 and 1999 Mr. Armstrong performed with singer Fides Krucker in Rainer Wiens' opera Down Here On Earth for Autumn Leaf Performance in Toronto and Montreal. In 2000 he directed Musigue Défilé; fashion show for the end of a century for Montreal's Nouvel Ensemble Moderne with music by Linda Bouchard and Marcelle Deschenes to celebrate the 1oth anniversary of the founding of the N.E.M. The work was performed to acclaim in Montreal and at the 2000 Singapore Arts Festival. In 2003 he directed Linda Bouchard's new opera The House of Words - based on Eduardo Galeano's Book of Embraces with students of the Experimental Theatre Wing at New York University . In 2001, he was a featured inspiration for the film The Former Mrs. Butterfly (a Dialogue on Voice) created and directed by Canadian filmmaker Julie Trimingham. In December 2002, he performed Sir Peter Maxwell Davies' Eight Songs for a Mad King in Vancouver to a standing ovation and rave reviews. (nb: RA designed and built the set for the premiere of this piece in London in 1969, with Roy Hart as soloist). 2006-2009 saw development workshops in Rome with composer Maurizio Squillante (for a new opera Alexander) and Montreal and Toronto (with composer Louis Dufort, performer/producer Fides Krucker, and librettist Tom Wormsley). In 2012 the world premier of Dufort's opera Julie Sits Waiting led to five Dora Award nominations in 2013. In 2015 Mr. Armstrong reprised his role as George III in Peter Maxwell Davies' Eight Songs for a Mad King for Butler University's Artsfest filmed by PBS Indianapolis, with vocal coaching by Jonathan Hart. Mr. Armstrong collaborated as vocal coach with choreographer Martha Clarke in her critically acclaimed Angel Reapers, premiered at The American Dance Festival in North Carolina in 2010, revived that same year at the Joyce Theatre NYC, and remounted at The Signature Theatre NYC in 2016. Mr. Armstrong provided vocal direction for photographer Rosalind Solomon's lecture Jumping Off Place: How My Life Animates My Work. Mr. Armstrong conceived and directed two MainStage productions for NYU's Experimental Theatre Wing, I Think I'm Falling in 2013, and DKTMS a cabaret for dark times in 2017, both in collaboration with Jonathan Hart as music director.